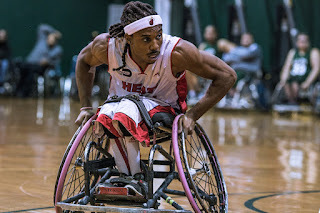 From director Shaina Allen, producer Michael Esposito, and Emmy Award-winning Executive Producers Nick Nanton and JW Dicks comes THE REBOUND – a feel good story about the Miami Heat Wheels and their quest for their first-ever NWBA Championship – to Digital HD November 20th. Miami is a city known for its sports and diversity. For the Miami Heat Wheels it’s a city of opportunity, second chances, and a call to win against all odds. THE REBOUND is an insider’s look at the struggling wheelchair basketball team following a defeat at the national championships. In community supported wheelchair basketball programs across the nation, players push their way physically, mentally and emotionally through each season without the recognition or the resources of mainstream sports. Among the Heat Wheels, passion and drive are abundant, but the team’s dwindling checkbook threatens to cut short its attempt to take the national title. Debut filmmakers Shaina Allen and Mike Esposito step deep inside the lives of three players as they endure and respond to adversity and fight their way to a second chance. Friends, family, and pride hang in the balance as these men find an extraordinary gift in the hand life has dealt. They hope for an education, a big break, and a new life. The cameras don’t stop when the players leave the court: the film follows them through the trials of daily life with a disability. With each victory, the players, and their team, get closer to the idea that anything is possible – and it’s all about how you rebound. THE REBOUND is a production of Evergrain Studios in association with DNA Films.